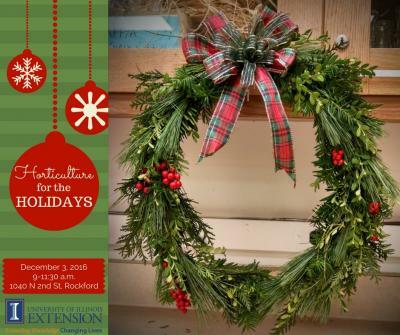 Join University of Illinois Extension for their annual Horticulture for the Holidays workshop! Participants will participate in a make-and-take workshop that demonstrates how to incorporate the garden into seasonal celebrations and gift giving. Samantha Burbach, University of Illinois Extension Program Coordinator, will present Evergreen Wreaths. The smell of fresh evergreens goes hand-in-hand with the holidays. Learn about evergreens and which ones work well for creating wreaths and holiday swags. Then learn how to put together a fresh evergreen wreath to adorn your home for the holiday season. Sam will show step-by-step instructions on how to construct a fresh evergreen wreath, complete with a bow and even pinecones or berries. She will also show how versatile wreaths can be from hanging on your door to being dressed up on your table as a centerpiece. The program fee of $25 includes all workshop materials and refreshments. Pre-registration and payment are required by December 1st to secure your spot. Space is limited. Please note: The office is located on a frontage road; you cannot access our parking lot directly from N. 2nd Street. Enter at Ethel Avenue (near Nicholas Conservatory), drive towards river and follow road south to the parking lot at the end by the red brick building. Enter through the West door closest to the river. If you need a reasonable accommodation to participate in this program, please contact the Winnebago County Extension Office at 815-986-4357.